The IPCO sulphur degasser is an efficient and economical process for reducing poisonous hydrogen sulfide in liquid sulphur. 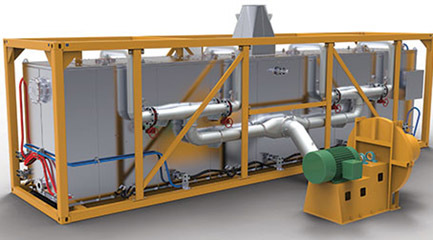 Designed by experts in sulphur degassing technology with extensive operations experience, our liquid sulphur degasser is the new standard for reliable reduction in hydrogen sulfide. Molten sulphur is pumped through the degassing reactor where billions of tiny air bubbles transfer the H2S gas from the molten liquid to the headspace of the sealed reactor tank. A carefully defined volume of catalysts is then introduced, quickly reducing the hydrogen polysulfide molecules to gaseous H2S, resulting in the degassing of both H2S and H2Sx within the molten sulphur. H2S rich airflow exits the degassing reactor and is transferred via ducting to an appropriate effluent treatment system, while the degassed molten sulphur is transferred to downstream systems.